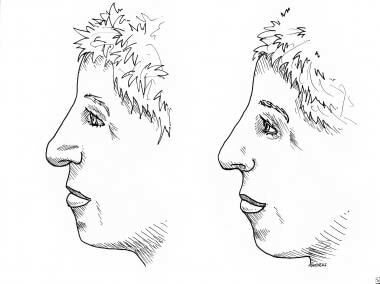 Nasal shape profoundly influences facial appearance because of the central position and anterior projection of the nose on the face. The shape and rotation of the nasal tip are of utmost importance in nasal assessment. Variation in nasal tip asymmetry is the most common complaint of patients requesting rhinoplastic surgery, and the goal of nearly every rhinoplasty is to achieve lower nasal third rotation. Because of the importance of nasal tip rotation in function and cosmesis of the nose, the nasal surgeon must possess the knowledge and skill to prevent and correct nasal tip ptosis. 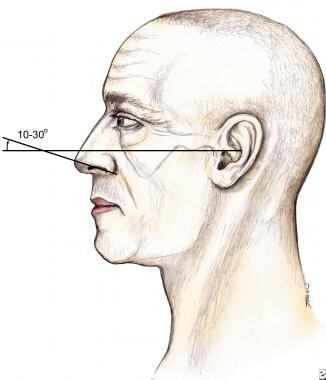 Tip rotation is most commonly assessed on the profile view of the nose by measuring the nasolabial angle (see the image below). The nasolabial angle is measured by a line from the subnasale to the superior vermilion and by a tangent of the columella from the subnasale. The aesthetic ideal for the nasolabial angle is defined by a range of 90-100° in men and 100-110° in women. This aesthetic ideal must be considered in light of the other physical characteristics of the patient. For instance, shorter people usually can tolerate greater tip rotation without sacrificing cosmesis, while greater tip rotation should especially be avoided in taller people to avoid excessive nostril show. Rhinoplasty, tip ptosis. Tip rotation can be assessed by measuring the nasolabial angle. The aesthetic ideal for this measurement is 90-100° in men and 100-115° in women. Multiple factors, such as prominence of the anterior nasal spine, maxillary retrusion or prognathism, and asymmetry of the medial crura, may influence the inclination of the columella without correspondingly affecting the inclination of the nasal tip or long axis of the columella. Because of this, use of the nasolabial angle in assessing tip ptosis may be misleading. A more accurate assessment uses measurement of the long axis of the nostril rim with the Frankfort plane (see the image below). In this assessment, the aesthetically ideal angle ranges from 10-30° in women and 0-15° in men. The long axis of the columella should be parallel to the long axis of the nostril rim, and the alar rim should form a smooth arch 2-4 mm above the edge of the columella. Nasal tip ptosis is then defined as a more acute angle between the long axis of the nostril and the Frankfort plane than the aesthetic ideals mentioned above. Rhinoplasty, tip ptosis. Nasal tip rotation can be assessed more accurately by measuring the angle between the long axis of the nostril rim and the Frankfort plane. The aesthetic ideal for this measurement is 0-15° in men and 10-30° in women. Nasal tip ptosis is often observed following nasal trauma. As a part of the aging face, tip ptosis is the predominant feature of nasal aging (see the image below). In addition, it is one of the most common findings in patients presenting for primary rhinoplasty. Nearly every rhinoplasty involves maneuvers to achieve and maintain adequate tip rotation. Nasal tip ptosis is also one of the most common findings in patients presenting for secondary rhinoplasty, and iatrogenic destruction of nasal tip support is a common finding in late development of tip ptosis following rhinoplasty. Rhinoplasty, tip ptosis. Nasal tip ptosis is a prominent feature of the aging face. Tip ptosis in this setting results from senile changes in the major and minor tip support mechanisms. The tripod concept of nasal tip support and the major and minor tip support mechanisms must be considered in nasal tip ptosis. 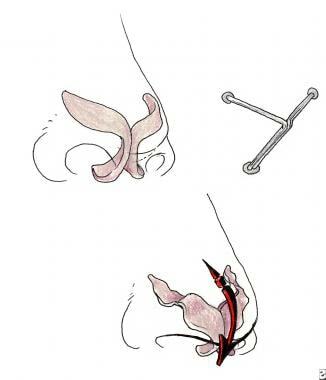 If the lower lateral cartilages of the nose are compared to a tripod, with the medial crura as one leg and the lateral crura as the other two supporting legs, envisioning changes in tip rotation with alterations in the tip supporting structures is easy (see the image below). In addition, the integrity of the medial and lateral crura, the attachment of the medial crural feet to the caudal end of the quadrangular cartilage, and the scroll-like attachment of the caudal end of the upper lateral cartilage to the cephalic margins of the lateral crura are the major tip support structures to consider. Rhinoplasty, tip ptosis. Tip support can be conceptualized as a tripod with the medial crura as 1 supporting leg and the lateral crura as the other 2 legs. Using this model, changes in tip rotation can be predicted when the integrity of the supporting limbs is altered. The minor tip support mechanisms include (1) the dorsal cartilaginous septum, (2) the interdomal ligaments, (3) the nasal spine, (4) the membranous septum, and (5) the alar attachments to the skin. Alterations in the size, shape, and integrity of the limbs of the tripod, together with the disruption of the major and minor tip support mechanisms, result in profound alteration in tip rotation. If medial crural integrity is compromised, the nasal tip rotates inferiorly as the supporting limb of the tripod buckles under the weight of the overlying skin-soft tissue envelope. This is the most common factor in tip ptosis secondary to trauma, including iatrogenic insult. Additionally, noses with congenitally short or flimsy medial crura display this type of tip ptosis. Loss of the supporting attachment of the lateral crura and the upper lateral cartilage results in tip ptosis. Trauma, including excessive trimming of the lower lateral cartilage during rhinoplasty, can result in this type of inferior collapse of the nasal tip as the major tip support mechanisms are compromised. Senile ptosis of the nose can also be explained by this factor, as the ligamentous attachments of the upper and lower lateral cartilages lose their integrity with age. Excessive length of the lateral crura depresses the tip inferiorly, as does excessive caudal projection of the cartilaginous septum. This is a common finding in patients with the tension nose. Finally, the tethering of the columella, as in clefting of the palate (particularly with bilateral clefts) or in contracture following nasal or lip trauma, can result in nasal ptosis. In short, nasal ptosis commonly results from a discrepancy between the tip support and the downward force of gravity on the overlying skin soft-tissue envelope. Patients presenting for rhinoplasty frequently do not recognize the presence of nasal ptosis and how it affects their nasal aesthetic appearance. Tip ptosis is most pronounced on lateral view, and it may have to be demonstrated to patients during part of their surgical workup by using their photos. Elderly patients with senile tip ptosis may present to the surgeon experiencing nasal obstruction. Elevating the tip of the nose may improve nasal airflow in these patients. The lower lateral cartilages of the nose can be compared to a tripod, with the medial crura as one leg and the lateral crura as the other two supporting legs. The integrity of the medial and lateral crura, the attachment of the medial crural feet to the caudal end of the quadrangular cartilage, and the scroll-like attachment of the caudal end of the upper lateral cartilage to the cephalic margins of the lateral crura are the major tip support structures. The minor tip support mechanisms include (1) the dorsal cartilaginous septum, (2) the interdomal ligaments, (3) the nasal spine, (4) the membranous septum, and (5) the alar attachments to the skin. For more information, see the eMedicine topic Nose Anatomy. Correction of nasal tip ptosis requires an adequate well-vascularized skin and soft tissue envelope to redrape over the nasal skeleton, as well as adequate cartilaginous skeletal support. In patients with extensive nasal trauma or previous surgical manipulation, these structures can be insufficient to withstand aggressive surgical manipulation. Consider conservative measures, and sometimes avoiding surgical manipulation altogether, for patients with poorly vascularized soft tissue, extensive loss of cartilaginous support, or other factors that would adversely affect cosmetic and functional outcome. In addition, avoid extensive manipulation of the nasal skeleton in infants and young children to prevent scarring and strictures that may affect nasal and midfacial growth. Wagner W. [Stabilizing cartilage grafts in functional-aesthetic rhinoplasty]. Laryngorhinootologie. 2008 Oct. 87(10):697-702. [Medline]. Mihajlovic D, Olariu D, Kaushal S, Crainiceanu Z, Bodog F. Surgical solutions to nasal tip ptosis. AMT. 2013. 2 (1):207-9. Bilen B, Kilinc H, Tenekeci G. Nasal tip contouring using lower lateral cartilages. J Craniofac Surg. 2011 Nov. 22(6):2214-9. [Medline]. Zuliani GF, Silver WE. Analysis of nasal ptosis correction using lower lateral to upper lateral cartilage suspension. Arch Facial Plast Surg. 2011 Jan-Feb. 13(1):26-30. [Medline]. Tugrul S, Dogan R, Kocak I, Eren SB, Ozturan O. Split Cartilage Resection of Nasal Dome: A Solution to Ptotic Nasal Tips. J Craniofac Surg. 2015 Jul. 26 (5):e400-5. [Medline]. Cardenas JC, Carvajal J, Ruiz A. Securing nasal tip rotation through suspension suture technique. Plast Reconstr Surg. 2006 May. 117(6):1750-5; discussion 1756-7. [Medline]. Konior RJ. The droopy nasal tip. Facial Plast Surg Clin North Am. 2006 Nov. 14 (4):291-9, v. [Medline]. Margulis A, Harel M. Management of severe tip ptosis in closed rhinoplasty: the horizontal columellar strut. J Plast Reconstr Aesthet Surg. 2007. 60(4):400-6. [Medline]. Pedroza F, Anjos GC, Patrocinio LG, Barreto JM, Cortes J, Quessep SH. Seagull wing graft: a technique for the replacement of lower lateral cartilages. Arch Facial Plast Surg. 2006 Nov-Dec. 8(6):396-403. [Medline]. Toriumi DM. New concepts in nasal tip contouring. Arch Facial Plast Surg. 2006 May-Jun. 8(3):156-85. [Medline]. Rhinoplasty, tip ptosis. Tip support and rotation are increased by suturing a cartilaginous strut graft between the medial crura. The graft should be placed above the anterior nasal spine to prevent lateral displacement and subsequent tilting of the nasal tip. Rhinoplasty, tip ptosis. Conservative resection of the cephalad border of the lower lateral cartilage can be an effective means of attaining tip rotation. Care should be taken to preserve adequate lateral crus (minimum of 7 mm) to prevent alar collapse and nasal obstruction. Rhinoplasty, tip ptosis. Rotation of the nasal tip can be achieved with the addition of an onlay cartilaginous tip graft. Further degrees of rotation are achieved by more cephalad positioning and fixation of the graft. Nasal tip ptosis secondary to tension nose with excessive caudal projection of the cartilaginous septum. This patient had correction of her nasal tip ptosis with open septorhinoplasty and caudal and dorsal septal trimming, conservative cephalic trimming of her lateral crura, strut grafting, tip grafting, and medial crural feet repositioning.